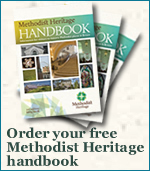 The Wesleyan and Primitive Methodists and Church Army all used 'Gospel cars' in the nineteenth and early twentieth century. 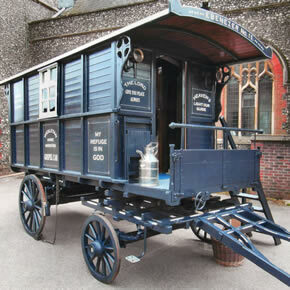 Within Methodism, horsedrawn wagons were partly replaced by hand-pushed 'trek carts' in the inter-war years, and finally by deaconess' caravans in the 1950s. Gospel Cars were used for ministry in markets, fairgrounds, at overnight moorings for barge and boat people, and to traveller camps, and to reach rural locations. This faithful reproduction of Car No 11 was built in 2011, and is currently housed on the Boat Dock at the Black Country Living Museum. This serves to link it within the museum campus with one of the historically marginalized groups - the boat and barge people - to whom the Gospel Car missioners were reaching out. The inside of the Gospel Car can be viewed from the front platform even when no-one is specifically on duty, so visitors can see for themselves how the Gospel Car operated. It was a little home on wheels - what are seats during the day were beds at night. 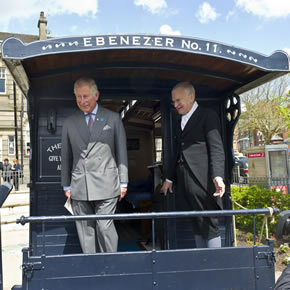 It was a little church on wheels - the bigger audience would be addressed from the platform while the smaller audience would be invited inside. It was a little audio-visual centre - see the organ and the pictures hanging from the all. What you may not see, because they are stored out of sight, are the gramophone, the percussion band instruments and the magic lantern. It sounds wonderful, but with walls of just a single plank thick it would certainly be very very cold on many a winter night. 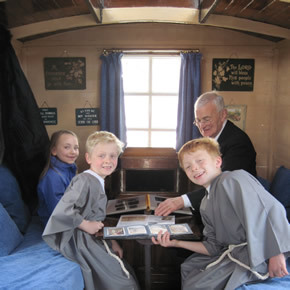 Admission is via the Black Country Living Museum where visitors will find that they can spend several fascinating hours on site as they visit other parts of the museum that will help them to view the Gospel Car within the context of the society of that day. For further information about opening hours and admission costs please contact the Black Country Living Museum,Tipton Road, Dudley DY1 4SQ, tel 0121 557 9643. The Gospel Car will remain at the Black Country Living Museum until the autumn of 2019. Car: On the A4037 (Tipton Road) 3 miles/5km from Junction 2 M5 or 6 miles/10km from Junction 10 of M6. Bus: Frequent services from Birmingham and around the Black Country locally. Train: Nearest station is Tipton (1 mile)..